Thread: https - Does it make a difference? We are in the process of a major site update and at the end are considering whether it is worth changing to https rather then just http. I haven't yet but I think it's comming and soon, I also think it's the device your on, meaning mobile or desktop...At the current moment. Rankings partially but not a massive amount. However, there are benefits to being HTTPS in that Chrome in July will be marking http pages as not secure, which will push a lot of people off the website. There are also user experience benefits with https, that they've been told to trust the green lock and there's speed benefits too, utilising something like http/2 you can get a quicker site than you've got now even with no other tweaks, which'll increase conversion on ecommerce sites and just offer a better experience overall. It all depends.I personally don't think it is a huge factor but it is a very lightweight signal when it comes to ranking.There are many instances when loading speed itself slows down when people migrate to https.So there are lots of confusions.I rather wait to see if it really impact that much! Last edited by smkghosh; May 18th, 2018 at 07:02 AM. ‘I made the switch and am glad I did. Warnings would show when people went to my old site. Also, people wrote and told me they didn’t want to come for fear my site was shady. I was so happy with the improvements in my organic traffic and site speed, I blogged about it. I am new here am I allowed to leave a link to my post in my answer? I highly recommend switching. My organic traffic is up over 200%! I would love to see it, please do link it! Last edited by Hikin Mike; May 19th, 2018 at 07:57 PM. I'm glad your sites getting more traffic since the move to Cloudflare. A switch to https alone simply wouldn't make your site million times quicker like you've suggested in your article, it's just not what an SSL does. HTTP/2 which Cloudflare provides by default does, in fact, speed up sites a little because it stops blocking- but not the improvements you've seen on GTmetrixs. You'll have seen these results due to the other things Cloudflare brings, such are caching your site for example, their CDN, railgun, a whole load of awesome things they implement. 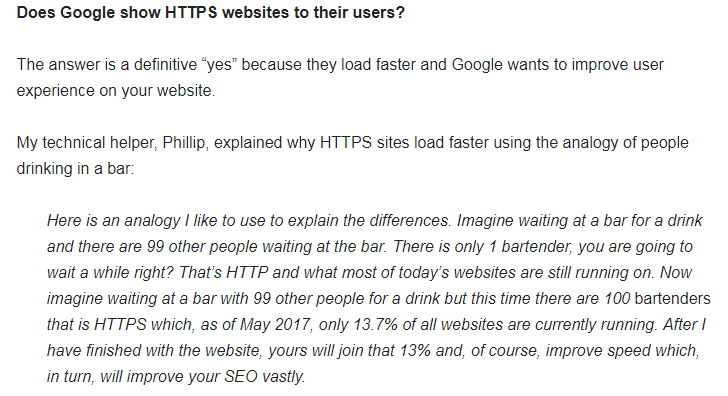 Because of this, you can't really say "https is the reason for my site speeding up", or that it's the reason for your rankings increasing. When you went to Cloudflare, it would've improved many things with your site, things which are already confirmed ranking factors on Google - so saying "it's because of https" isn't accurate because too many things were changed at once when moving to Cloudflare. Congrats on the traffic increase, and I hope it continues to grow! I'm afraid there's a bit wrong here. Google is showing these sites more because they're more secure, not because of their speed. By default without any tweaks https is actually slower, due to a longer initial connection time. The reason why it is quicker is because of something called HTTP/2 which requires HTTPS to function. It's allowing the website to return multiple files back at once. As you can see, the cream coloured bar is actually the browser waiting to receive the files. Now with http/2 enabled you can see that cream coloured bar is no longer here. Thank you for reading what I wrote and for the clarification. I have a question here, I am running my website on http so when i Shift it on https does it hurt my SEO, as I have created links with http, not with https? I know my question is little stupid but still I need to know about it can you pls tell explain it? You will need to do a 301 redirect to redirect the http pages to the https. If you do this there should be no problem with the SEO aspect. It means its necessary to do this action otherwise, it can make some negative impact on my SEO? Yes. You must 301 redirect to avoid negative impacts.. Okay thanks a lot for guidance! EMD or Near EMD will it make a difference? How much difference does this url make?